[S355] Rod Bush, "Fortson Family," online at http://home.sprynet.com/sprynet/rodbush/FortsonA.htm, viewed on 5 Dec 1997. [S355] Rod Bush, "Fortson Family," online at http://home.sprynet.com/sprynet/rodbush/FortsonA.htm, viewed on 5 Dec 1997 (naming William Richardson as her father). [S1051] O'Levia Neil Wilson Wiese, ed., Cemetery Records of Greene County, Alabama and Related Areas: The Journal of Mrs. Mary Marshall (Waco, Tex. : n.pub., 1980), p. 100 (naming William Richardson as her father). [S355] Rod Bush, "Fortson Family," online at http://home.sprynet.com/sprynet/rodbush/FortsonA.htm, viewed on 5 Dec 1997 (naming Betsy Harrison as her mother). [S1050] Pauline Jones Gandrud, comp., Marriage Records of Greene County, Alabama 1823-1860 (Memphis, Tenn.: Milestone Press, 1969), p. 50 (identifying her as Elizabeth Richardson). [S355] Rod Bush, "Fortson Family," online at http://home.sprynet.com/sprynet/rodbush/FortsonA.htm, viewed on 5 Dec 1997 (naming Mary Ann Elizabeth Richardson as his mother). [S355] Rod Bush, "Fortson Family," online at http://home.sprynet.com/sprynet/rodbush/FortsonA.htm, viewed on 5 Dec 1997 (naming Mary Ann Elizabeth Richardson as her mother). [S1051] O'Levia Neil Wilson Wiese, ed., Cemetery Records of Greene County, Alabama, above, p. 100 (naming Elizabeth _____ as his mother). Marriage*: He married Betsy Harrison. Marriage*: She married William Richardson. [S355] Rod Bush, "Fortson Family," online at http://home.sprynet.com/sprynet/rodbush/FortsonA.htm, viewed on 5 Dec 1997 (naming Elijah Satterwhite Fortson as his father). [S892] Wanda Tracy, electronic mail to e-mail address, 19 Dec 2001, attributing information to Nancy Blakeley Ruff, Harrison County Early Marriage Records, 1839-1869. [S355] Rod Bush, "Fortson Family," online at http://home.sprynet.com/sprynet/rodbush/FortsonA.htm, viewed on 5 Dec 1997 (naming Francis Marion Fortson as her father). [S355] Rod Bush, "Fortson Family," online at http://home.sprynet.com/sprynet/rodbush/FortsonA.htm, viewed on 5 Dec 1997 (naming Francis Marion Fortson as his father). [S355] Rod Bush, "Fortson Family," online at http://home.sprynet.com/sprynet/rodbush/FortsonA.htm, viewed on 5 Dec 1997 (naming James A. Fortson as his father). [S355] Rod Bush, "Fortson Family," online at http://home.sprynet.com/sprynet/rodbush/FortsonA.htm, viewed on 5 Dec 1997 (naming James A. Fortson as this child's father). [S355] Rod Bush, "Fortson Family," online at http://home.sprynet.com/sprynet/rodbush/FortsonA.htm, viewed on 5 Dec 1997 (naming James A. Fortson as her father). [S961] Find A Grave, online at http://www.findagrave.com, memorial for Rev. E. R. Fortson, memorial no. 68524666, viewed on 10 Oct 2013 (giving the date but not the place). [S961] Find A Grave, online, above, memorial for Rev. E. R. Fortson, memorial no. 68524666, viewed on 10 Oct 2013. [S1282] The Daily Picayune, New Orleans, La., 1 Feb 1905, p. 7, col. 4 (obituary of Rev. Elijah R. Fortson). [S1282] The Daily Picayune, New Orleans, La., 1 Feb 1905, p. 7, col. 4. [S355] Rod Bush, "Fortson Family," online at http://home.sprynet.com/sprynet/rodbush/FortsonA.htm, viewed on 5 Dec 1997 (stating that he was a minister, was born on 30 Jan 1905, and married sisters). [S961] Find A Grave, online, above, memorial for Rev. E. R. Fortson, memorial no. 68524666, viewed on 10 Oct 2013 (stating that he died on 30 Jan 1905). [S355] Rod Bush, "Fortson Family," online at http://home.sprynet.com/sprynet/rodbush/FortsonA.htm, viewed on 5 Dec 1997 (naming Elijah Richardson Fortson as her father). [S355] Rod Bush, "Fortson Family," online at http://home.sprynet.com/sprynet/rodbush/FortsonA.htm, viewed on 5 Dec 1997 (naming Elijah Richardson Fortson as his father). [S355] Rod Bush, "Fortson Family," online at http://home.sprynet.com/sprynet/rodbush/FortsonA.htm, viewed on 5 Dec 1997 (naming Elijah Richardson Fortson as this child's father). [S355] Rod Bush, "Fortson Family," online at http://home.sprynet.com/sprynet/rodbush/FortsonA.htm, viewed on 5 Dec 1997 (naming Jeptha Lafayette ['J.L.'] Fortson as her father). [S355] Rod Bush, "Fortson Family," online at http://home.sprynet.com/sprynet/rodbush/FortsonA.htm, viewed on 5 Dec 1997 (naming Jeptha Lafayette ['J.L.'] Fortson as his father). Marriage*: He married Ella _____. Other Names*: Washington Fortson, W. P. Fortson. Note*: He was murdered. His body was not located for some time and eventually was found floating in the Red River. [S355] Rod Bush, "Fortson Family," online at http://home.sprynet.com/sprynet/rodbush/FortsonA.htm, viewed on 5 Dec 1997 (giving the year but no other information). [S355] Rod Bush, "Fortson Family," online at http://home.sprynet.com/sprynet/rodbush/FortsonA.htm, viewed on 5 Dec 1997 (naming Elijah Satterwhite Fortson as her father). [S355] Rod Bush, "Fortson Family," online at http://home.sprynet.com/sprynet/rodbush/FortsonA.htm, viewed on 5 Dec 1997 (naming Martha E. Fortson as his mother). [S355] Rod Bush, "Fortson Family," online at http://home.sprynet.com/sprynet/rodbush/FortsonA.htm, viewed on 5 Dec 1997 (naming Martha E. Fortson as her mother). [S1051] O'Levia Neil Wilson Wiese, ed., Cemetery Records of Greene County, Alabama and Related Areas: The Journal of Mrs. Mary Marshall (Waco, Tex. : n.pub., 1980), p. 100 (naming Elijah Fortson as his father). [S1051] O'Levia Neil Wilson Wiese, ed., Cemetery Records of Greene County, Alabama, above, p. 100 (giving the date but not the place). [S1051] O'Levia Neil Wilson Wiese, ed., Cemetery Records of Greene County, Alabama, above, p. 100 (stating that he is buried in an "unnamed cemetery" that is located "in wooded area on road between Homer Bambarger's store and Bush Creek in Greene Co."). [S355] Rod Bush, "Fortson Family," online at http://home.sprynet.com/sprynet/rodbush/FortsonA.htm, viewed on 5 Dec 1997 (naming Josiah Ricks as her father). [S528] Karen Trient, electronic mail to Roger Bartlett, 30 Dec 1999, (naming Josiah Ricks as her father). [S528] Karen Trient, electronic mail to Roger Bartlett, 30 Dec 1999, (not giving the date or place). [S355] Rod Bush, "Fortson Family," online at http://home.sprynet.com/sprynet/rodbush/FortsonA.htm, viewed on 5 Dec 1997 (naming Harriet Ricks as his mother). [S355] Rod Bush, "Fortson Family," online at http://home.sprynet.com/sprynet/rodbush/FortsonA.htm, viewed on 5 Dec 1997 (naming Harriet Ricks as her mother). Christine Elizabeth Harper's tombstone, Nursery Cemetery, Victoria, Tex., by Bob Kelch. • Her page at Find A Grave is here. [S961] Find A Grave, online at http://www.findagrave.com, memorial for Christine Elizabeth Harper, memorial no. 46303288, viewed on 26 Jul 2011 (naming Pelham Borden Harper as her mother). [S961] Find A Grave, online, above, memorial for Christine Elizabeth Harper, memorial no. 46303288, viewed on 26 Jul 2011 (naming Dr. Warren Alexander Harper as her father). 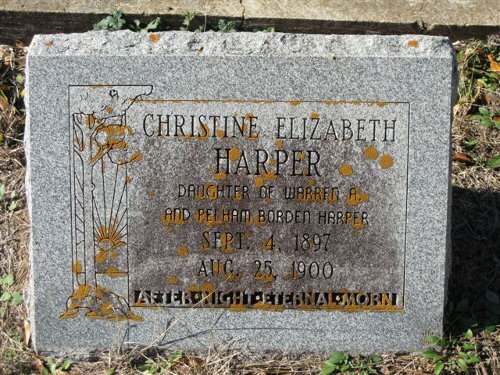 [S961] Find A Grave, online, above, memorial for Christine Elizabeth Harper, memorial no. 46303288, viewed on 26 Jul 2011. 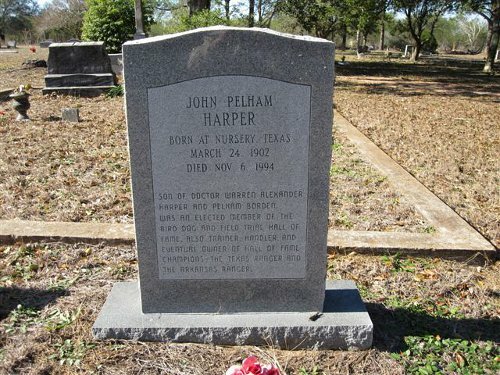 John Pelham Harper's tombstone, Nursery Cemetery, Victoria, Tex., by Bob Kelch. • His page at Find A Grave is here. [S961] Find A Grave, online at http://www.findagrave.com, memorial for John Pelham Harper, memorial no. 46303428, viewed on 26 Jul 2011 (naming Dr. Warren Alexander Harper as his father). [S961] Find A Grave, online, above, memorial for John Pelham Harper, memorial no. 46303428, viewed on 26 Jul 2011 (naming Pelham Borden Harper as his mother). [S961] Find A Grave, online, above, memorial for John Pelham Harper, memorial no. 46303428, viewed on 26 Jul 2011. [S355] Rod Bush, "Fortson Family," online at http://home.sprynet.com/sprynet/rodbush/FortsonA.htm, viewed on 5 Dec 1997 (naming Roderick R. Fortson as her father). [S355] Rod Bush, "Fortson Family," online at http://home.sprynet.com/sprynet/rodbush/FortsonA.htm, viewed on 5 Dec 1997 (naming Sarah Ann Fortson as her mother). [S355] Rod Bush, "Fortson Family," online at http://home.sprynet.com/sprynet/rodbush/FortsonA.htm, viewed on 5 Dec 1997 (naming Roderick R. Fortson as his father). [S355] Rod Bush, "Fortson Family," online at http://home.sprynet.com/sprynet/rodbush/FortsonA.htm, viewed on 5 Dec 1997 (naming Josiah Ricks Fortson as this child's father). [S355] Rod Bush, "Fortson Family," online at http://home.sprynet.com/sprynet/rodbush/FortsonA.htm, viewed on 5 Dec 1997 (naming Josiah Ricks Fortson as her father). [S355] Rod Bush, "Fortson Family," online at http://home.sprynet.com/sprynet/rodbush/FortsonA.htm, viewed on 5 Dec 1997 (naming Josiah Ricks Fortson as his father). [S528] Karen Trient, electronic mail to Roger Bartlett, 30 Dec 1999, (naming Roderick Ransom Fortson as his father). [S528] Karen Trient, electronic mail to Roger Bartlett, 30 Dec 1999, (attributing information to Roderick Sylvanus Fortson's death certificate, a copy of which is in her possession). [S355] Rod Bush, "Fortson Family," online at http://home.sprynet.com/sprynet/rodbush/FortsonA.htm, viewed on 5 Dec 1997 (not giving her surname and stating that they married circa 1863 in Texas). [S528] Karen Trient, electronic mail to Roger Bartlett, 30 Dec 1999, (giving only the date). [S11] Index to Texas Death Records (Austin, Tex. : Tex. Dept. of Health, Bur. of Vital Statistics), typescript, 1903-40, vol. 17, p. 8091, file 23839. [S943] Kathryn DeWitt Gazaway, comp., Con Can Cemetery and Sabinal Hwy 90 Cemetery (Utopia, Tex., Sabinal Canyon Chapter of Nat'l Soc'y D.A.R., 1991), p. 27 (stating that the grave is in Lot 3, Block 4, Sec. B but is unmarked). [S355] Rod Bush, "Fortson Family," online at http://home.sprynet.com/sprynet/rodbush/FortsonA.htm, viewed on 5 Dec 1997 (naming Roderick S. Fortson as her father). [S355] Rod Bush, "Fortson Family," online at http://home.sprynet.com/sprynet/rodbush/FortsonA.htm, viewed on 5 Dec 1997 (naming Roderick S. Fortson as his father). [S355] Rod Bush, "Fortson Family," online at http://home.sprynet.com/sprynet/rodbush/FortsonA.htm, viewed on 5 Dec 1997 (naming Catherine E. Williams as his mother). [S355] Rod Bush, "Fortson Family," online at http://home.sprynet.com/sprynet/rodbush/FortsonA.htm, viewed on 5 Dec 1997 (naming Catherine E. Williams as her mother). Marriage*: She married Peter E. Fortson, son of William Fortson and Ann Higginbotham. [S355] Rod Bush, "Fortson Family," online at http://home.sprynet.com/sprynet/rodbush/FortsonA.htm, viewed on 5 Dec 1997 (naming Peter E. Fortson as his father). [S1050] Pauline Jones Gandrud, comp., Marriage Records of Greene County, Alabama 1823-1860 (Memphis, Tenn.: Milestone Press, 1969), p. 50 (giving Pamela as her first name). [S355] Rod Bush, "Fortson Family," online at http://home.sprynet.com/sprynet/rodbush/FortsonA.htm, viewed on 5 Dec 1997 (naming Pamelia Willbanks as her mother). [S355] Rod Bush, "Fortson Family," online at http://home.sprynet.com/sprynet/rodbush/FortsonA.htm, viewed on 5 Dec 1997 (naming Pamelia Willbanks as his mother). [S355] Rod Bush, "Fortson Family," online at http://home.sprynet.com/sprynet/rodbush/FortsonA.htm, viewed on 5 Dec 1997 (naming Aaron J. Fortson as her father). [S355] Rod Bush, "Fortson Family," online at http://home.sprynet.com/sprynet/rodbush/FortsonA.htm, viewed on 5 Dec 1997 (naming Aaron J. Fortson as his father). [S709] Carol Jones, electronic mail to Roger Bartlett, 18 Nov 2001, (naming Aaron J. Fortson as his father). [S355] Rod Bush, "Fortson Family," online at http://home.sprynet.com/sprynet/rodbush/FortsonA.htm, viewed on 5 Dec 1997 (giving the date as circa 1845). [S709] Carol Jones, electronic mail to Roger Bartlett, 18 Nov 2001. [S355] Rod Bush, "Fortson Family," online at http://home.sprynet.com/sprynet/rodbush/FortsonA.htm, viewed on 5 Dec 1997 (giving the date as circa 1870). [S709] Carol Jones, electronic mail to Roger Bartlett, 18 Nov 2001, (giving only the date). [S355] Rod Bush, "Fortson Family," online at http://home.sprynet.com/sprynet/rodbush/FortsonA.htm, viewed on 5 Dec 1997 (naming Jeptha M. Fortson as this child's father). [S355] Rod Bush, "Fortson Family," online at http://home.sprynet.com/sprynet/rodbush/FortsonA.htm, viewed on 5 Dec 1997 (naming Jeptha M. Fortson as his father). [S709] Carol Jones, electronic mail to Roger Bartlett, 18 Nov 2001, (naming Jeptha Monroe Fortson as his father). [S897] Carol Jones, electronic mail to Roger Bartlett, 3 Jun 2001, (stating that he was a brother of Hattie Fortson). [S355] Rod Bush, "Fortson Family," online at http://home.sprynet.com/sprynet/rodbush/FortsonA.htm, viewed on 5 Dec 1997 (naming Jeptha M. Fortson as her father). [S709] Carol Jones, electronic mail to Roger Bartlett, 18 Nov 2001, (naming Jeptha Monroe Fortson as her father). [S897] Carol Jones, electronic mail to Roger Bartlett, 3 Jun 2001, (naming Jeptha M. Fortson as her father). [S896] Carol Joan Arthur-Jones, electronic mail to Roger Bartlett, 22 May 2001, (naming Jeptha M. Fortson as her father). [S1050] Pauline Jones Gandrud, comp., Marriage Records of Greene County, Alabama 1823-1860 (Memphis, Tenn.: Milestone Press, 1969), p. 115 (spelling his surname as Pendigrass). [S355] Rod Bush, "Fortson Family," online at http://home.sprynet.com/sprynet/rodbush/FortsonA.htm, viewed on 5 Dec 1997 (naming Ransom Pendergrass as her father). [S355] Rod Bush, "Fortson Family," online at http://home.sprynet.com/sprynet/rodbush/FortsonA.htm, viewed on 5 Dec 1997 (naming Ransom Pendergrass as his father). [S355] Rod Bush, "Fortson Family," online at http://home.sprynet.com/sprynet/rodbush/FortsonA.htm, viewed on 5 Dec 1997 (naming Elizabeth A. Ridgeway as her mother). [S355] Rod Bush, "Fortson Family," online at http://home.sprynet.com/sprynet/rodbush/FortsonA.htm, viewed on 5 Dec 1997 (naming Elizabeth A. Ridgeway as his mother).